Linamar is flourishing: It has posted 22 straight quarters of double-digit earnings growth. TORONTO -- Linamar Corp. is a perfect poster child for globalization. Founded by a refugee fleeing Soviet aggression in his native Hungary, the Canadian auto-parts maker has 24,500 employees spread around 12 countries. Its supply chain weaves in and out of dozens of nations -- a single part can cross seven borders before finding its final home in a completed vehicle. Going global has paid off handsomely. The C$3.75 billion (US$2.8 billion) company just posted its 22nd quarter of double-digit earnings growth and investors have been rewarded: Shares have soared almost 30-fold since its low after the financial crisis in 2008. Enter Donald Trump. The U.S. president’s election is the latest in a string of populist, anti-globalization events. On April 24 he lashed out against Canada’s support for domestic lumber and dairy industries after calling the North American Free Trade Agreement a “disaster.” A renegotiation of the free trade pact is looming and House Speaker Paul Ryan is pushing a 20 per cent border tax. 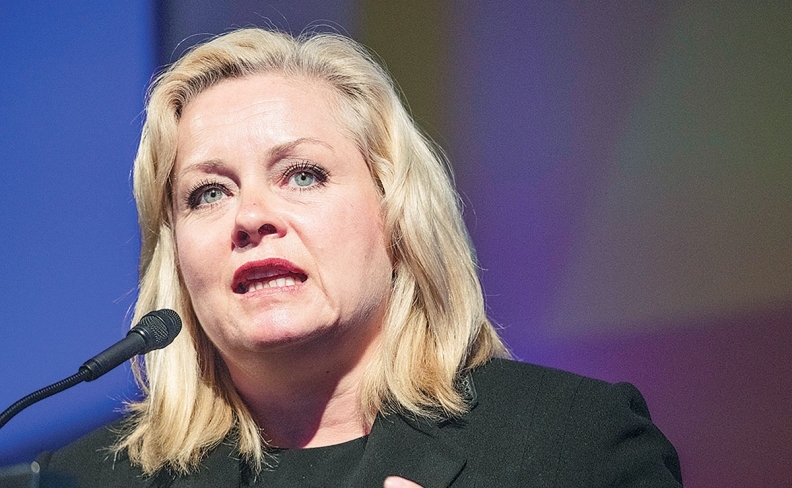 Linamar CEO Linda Hasenfratz, 50, is undaunted. “We need to break down barriers in how we work together, not create new ones. “I continue to be a big believer in globalization and free trade,” she said in an interview at her headquarters in Guelph, Ont., an hour’s drive west of Toronto, where her father Frank started machining parts in his garage in 1966. Hasenfratz took over from him in 2002, making the company even more global with a push into Asia. “Let’s tap into where the strengths are and not worry about where the borders are,” Hasenfratz said. She told Trump as much herself during a visit to the White House in February with Canadian Prime Minister Justin Trudeau. Hasenfratz thinks cooler heads will prevail, and that any real changes to trade in North America won’t come close to the level of Trump’s protectionist rhetoric. That same day, Trump said Canada’s relationship with the U.S. within NAFTA needed only a “tweak,” as opposed to more serious changes with Mexico. He targeted Canada last week however, calling the dairy trade a “disgrace” and on Monday slapped tariffs of up to 24 per cent on Canadian softwood lumber. Trump needs to give Congress a 90-day notice about his intentions to open to up NAFTA talks. Free trade in North America has been the foundation of auto companies’ business plans for decades, said Tony Faria, director of the Office of Automotive Research at the University of Windsor, in Ontario. Even if a new NAFTA leaves the Canada-U.S. relationship unscathed, changes on how goods cross the U.S.-Mexico border would hurt Linamar, which has several of its facilities there and sources many of the components that go into its products from the country. A few buildings away from Linamar’s headquarters is Comtech Manufacturing, one of the company’s 28 facilities in Guelph. 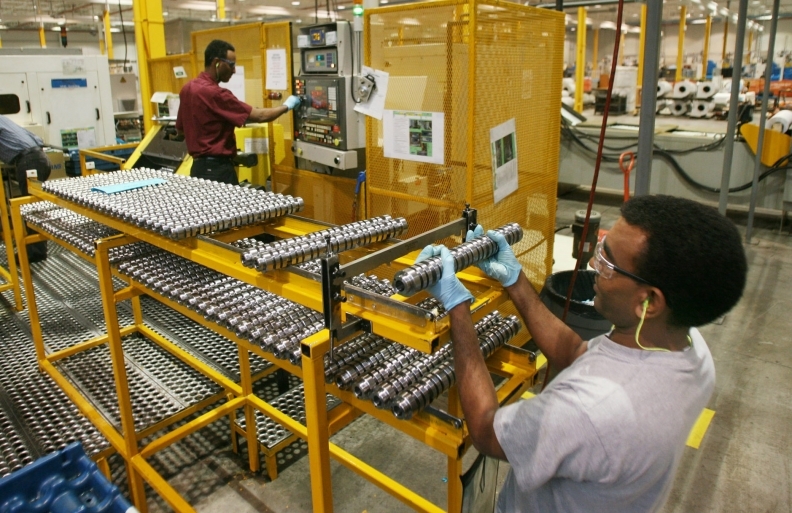 Rough aluminum blocks sent up from Mexico are being machined down into shiny cylinder heads, ready to be shipped to the United States and placed into high-performance engines. Keeping the entire continent connected is key for the competitiveness of the U.S. auto sector, Hasenfratz said. Her office is filled with gleaming metallic parts the company has produced in the past. “Eighty per cent of the world’s automotive production and sales is outside of North America so it’s critical for us to maintain the very best cost, quality and technology of products here,” she said. Even if borders thicken under Trump, Linamar will continue to push into new industries around the world. The company also builds parts for wind turbines, oil-drilling equipment and crop harvesters, as well as a line of construction lifts. That list could grow through acquisitions, Hasenfratz said, and she’s currently looking at healthcare and water as potential areas for purchases. “Water for a growing world, fresh clean water is an issue and we think there could be some opportunities there,” she said. The trend of outsourcing parts manufacturing is expanding, allowing Linamar to grow faster than the overall industry, Hasenfratz said. The company posted fourth-quarter earnings of C$1.76 per share last month, besting the highest analyst estimate.